In 1955, parent company Kaiser, introduced the CJ-5. It offered slightly larger dimensions than its little brother, the CJ-3B. It has an 81 in. wheelbase and a very tight turning radius compared to later models. The CJ5 was the longest running model in Jeep's history, and is recognized and admired all over the world. I love them! Razors. Bah!! This Jeep will always be worth more every year you own it, not like those overpriced side by sides that people are losing money on. Very low reserve!! There has been a lot of work and modifications done to this amazing CJ. Over $12,000.00 into it. Pictures of receipts, and previous adventures. 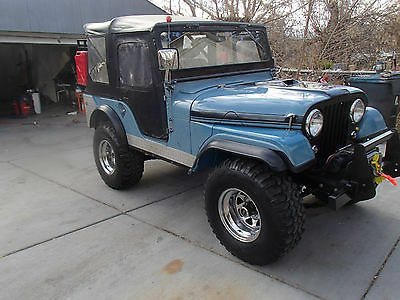 I will try to mention the main mods and features.1955 Willys Jeep CJ-5 custom built 4x4. Original steel body, hood, and opening tail gate. Fold down windshield with Advanced Adapter clamps. 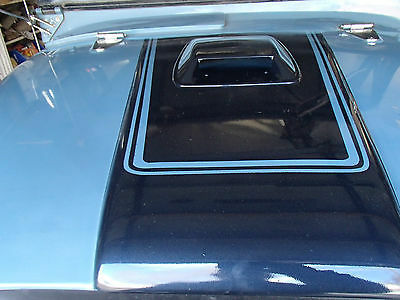 The body is very clean and solid, and has built in armor and sliders.Bucket seats. H.D belts. Power steering and brakes. Tilt column. 11 inch drums on front 10 inch rear. Custom dash insert with gauges. 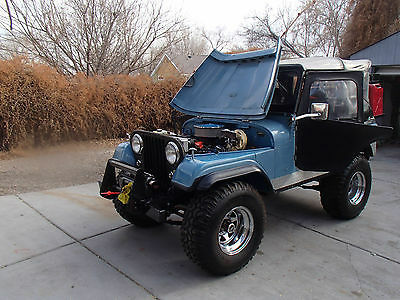 Odometer says 74k, and probably from donor auto, not this CJ. We were told it has less than 1000 miles on the drivetrain. Cable operated clutch and gas pedal.Fresh Buick 3.8 V-6 with HEI ignition. Rebuilt SM 420 four speed trans. About 7:1 granny low! T18 transfer case plus Warn overdrive give four shifters and makes 16 forward gears and 4 reverse. You have got to see how slow it moves in low range, low gear! New custom aluminum radiator with aux. electric fan for crawling, and I mean CRAWLING!Rancho suspension and shocks. About a 4 inch spring lift with poly body mounts and new bolts..Roll cage. AM FM radio. Rubicon safari rack with extra fuel cans. Rubicon ready!Warn 8000 winch. Warn locking hubs. Dana 44 with Power-loc rear diff. 5:38 gears. Summers Brothers titanium axles.Under hood compressor can be belt driven by the engine. Custom front bumper air tank for air tools, tires etc. and a tow bar. Custom rear bumper with pivot mounts for access to the rear, and mount the spare.New style fuel tank located in the rear with skid plate and new lines. New belts and hoses, and much,much more.Nice soft top with 1 set full and 1 set half doors with pockets and latches.Recent body off restoration. Just putting the finishing touches on it now. This would be a great gift for the avid sportsman. It will go just about anywhere you point it, AND get you back too. It runs like a top. Everything works as it should. Save $$$ This is priced for a quick sale, with the reserve a lot less than has been invested.We have bought and sold many older jeeps,(pics of a few that we have sold on EBAY) and this is one of the best we've had. We will do a BUY IT NOW for a fair offer, so the auction can end at anytime. Don't wait and lose this awesome Jeep. More pictures available, just email us.We sold a cj5 to a lady in Montana, and she wanted to surprise her husband on his birthday with it. So while her children took him out shopping, we showed up with the pictured orange one and put it in their garage! We are happy to help if we can. If you live in the western states we might be able to work something like that for you. Please call John or Connie at 435 884 1040 and let us know how we can help. We can supply copies of any documents you may need, and pictures of any area you want to look at.Its being sold as-is, where-is but we will work with your shipper, or perhaps bring it right to your door for an agreed on fee. 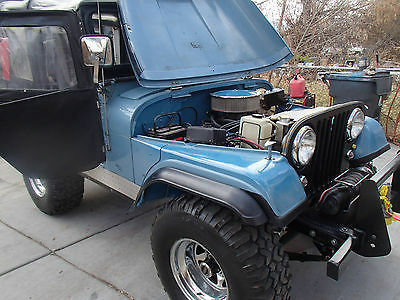 Any where between Denver, Reno, Butte, and Phoenix, we can do for around $500.00.Very low reserve for a Jeep this nice. Don't miss this one! Also, we are no longer dealing with Paypal. Their fees are way too high, and the transactions are a big hassle. Wire transfer, cash in person, cashiers checks will work. All funds must clear BEFORE the jeep leaves. Sorry, but that's the way things are now days.We have sold and shipped to England, Germany, Nova Scotia, Australia, Greenland, and some others I cant remember. Ebayers with 0 feedback must contact us before bidding. And included is a new style Jeep rear seat with factory lap belts for 2 passengers. The gas tank is not under the drivers seat anymore. Just serviced. Oil and filter, antifreeze, and gear oil. Also installed Bosch Platinum spark plugs. Ready to go! !